So I've been seriously neglecting my blog this year. Seventy days into the year, and there are barely a handful of posts. I've started cooking more, but when it's "let's throw these things together and hope it turns out tasty," precise measurements are neglected, and therefore recipes do not result. But I'm trying to make amends. It's much easier to blog when dinner starts with a recipe that I just failed to follow correctly - erm, made preferential changes to - like the tasty spinach salad I made Saturday night. Saturday was spent knowing I needed to get a lot of homework done so that the week wouldn't be stressful, and simultaneously doing absolutely nothing productive - no baked goods, n o cleaner room, no organized cabinets, no ironed clothes, no meandering walks - to avoid it. In all honesty, whatever I did was so mind-numbing that I don't remember what it was - until my friend called at two asking if I wanted to see a movie. Yes, a legitimate way to procrastinate! Count me in. An hour and a half later I was settling into the recently renovated theater with the permanently reclined seats as the opening credits blasted Bob Dylan's "The Times Are A-Changing." Three hours after that, my dad picked me up and -surprise! - two more guests for dinner. I relayed to him the contents of our refrigerator and my original plans for our dinner, and since I had planned for leftovers, it was easily adapted. We had plenty of food. Oh, the salad. While it was the risotto patties I was the most excited about, misinterpreting the word "has" and "can" led to a change. And while everyone loved the risotto, it was the salad that I found to be much more exciting. With just fifteen minutes, a flavorful, warm side salad resulted. I think I'm discovering warm salads a bit too late, considering it was in the 50s and 60s, but today it dropped back down to 20s. 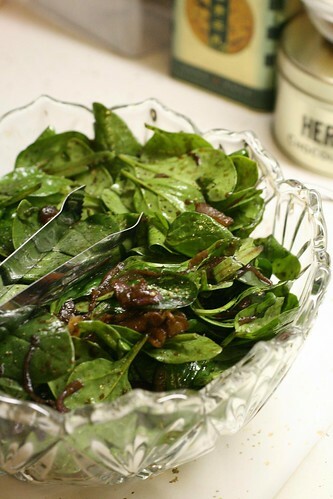 Regardless, the salad with the crisp spinach, mellowed fennel and onions, and sharp sweet balsamic is a keeper. Heat the oil in medium skillet over medium-high heat until shimmering. 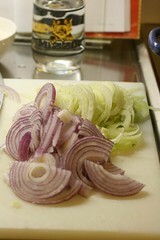 Add fennel, onion, salt, and cook, stirring occasionally, until the vegetables are softened and carmelizing, 6 to 8 minutes. Stir in the vinegar and cook just until syrupy, about 30 seconds to a minute. REmove the pan from the heat and stir in ground black pepper to taste. Scrape the fennel mixture into the bowl with the spinach, and toss to combine until spinach wilts slightly, about one minute. Serve immediately!